In the case of pub breweries, the entire beer clarification process is accomplished with the use of sheet or lenticular filters. However, for larger producers, especially package brewers, separation into separate clarification steps helps to reduce costs and achieve longer term beer stability. 1. Primary filtration removes solids and bulk yeast from the beer. 3. Fine filtration may reduce yeast level and removes fine particulates that could foul a final membrane filter. 4. Final membrane filtration removes organisms (bacteria and yeast) that could spoil the packaged beer. Generally there are four main clarification stages including primary filtration, trap filtration, fine filtration and final membrane filtration. Filtration at each stage is for a particular purpose: 1. Primary filtration removes solids and bulk yeast from the beer. 2. Trap filtration removes DE or other process additives 3. Fine filtration may reduce yeast level and removes fine particulates that could foul a final membrane filter. 4. Final membrane filtration removes organisms (bacteria and yeast) that could spoil the packaged beer. DE filtration is the classic technology for primary filtration. Though very effective, DE particles and yeast tend to bleed through the primary filter. Thus, trap filtration is important to protect downstream filtration applications. Alternatively, cross-flow systems, often coupled with other separations technologies (e.g. centrifuges), may be utilized for primary beer clarification. When used both trap and fine filtration steps may be eliminated. Microbiological stability is best achieved with membrane cartridges. Differential pressure (dP = inlet pressure – outlet pressure) is a critical measurement for all types of filter assemblies. Measurement and maintenance of differential pressure is especially critical for those filters with an unstable matrix (e.g. DE or some nominally rated depth filters). Differential pressure measurements may also be utilized as action levels. For example, a brewery may choose to start a filter cleaning cycle at 0.5 bar (~7 psi) or filter cartridge change out at 2 bar (~30 psi). The filtration of utilities is a critical factor to help protect the brand but also to protect the life of process filters and equipment (e.g. spray nozzles). Water for brewing is generally filtered either with disposable cartridge elements, both depth and membrane cartridges, or with cross-flow systems (e.g. hollow fiber or ceramic membranes). Service water for filter cleaning should be particulate filtered to a level of 1 Um. CO2 is generally filtered with a double or single layer PTFE microbially rated membrane. Primary filtration is the clarification process to remove bulk yeast from fermented beer. Typcial inlet turbidity values of 60-120 EBC and yeast cell count of about 10 million cells/mL. Sedimentation alone cannot provide the level of beer clarity required for the next processing stages. This stage helps to remove haze forming materials such as protein-polyphenol conglomerates and hop resins prior to downstream filtration. Beer clarification is carried out via DE or cross-flow filters. For stabilization the beer is treated with PVPP (Polyvinylpolypyrolidone) to remove polyphenols and/or silica gel for protein removal. DE filtration starts with pre-coating a support medium (e.g. a screen) with a coarse filter aid in a slurry with water or beer. Once a cake is formed on the support medium, dosing beer with DE continues throughout the filtration batch. Cake discharge and cleaning is required when the filter cake builds to a maximum depth or pressure in the vessel builds to a set point. Inlet and outlet quality should be monitored especially at the start and end of a filtration batch. Recirculation or disposal may be required for the initial or final beer filtrate. The avoidance of pressure and temperature differences is critical to ensure the carbon dioxide in the beer stays in solution and start foaming. Foam may foul downstream filtration stages. Cross-flow filtration for primary clarification often requires the use of a centrifuge for removal of bulk yeast and large particles to protect membranes providing the fine clarification. The addition of filter aids (e.g. DE, perlite, cellulose, polymer fibers) is not required for effective clarification by cross-flow filtration. The pore size of the cross-flow membrane utilized provides bright beer with consistent quality. Additionally, cross-flow filtration systems support a sustainable message. The CO2 footprint and the water consumption are significantly lower for cross-flow filtration systems than for conventional technologies. DE Regeneration offers another possibility to reduce the consumption and disposal of DE. When a horizontal leaf filter system is employed, brewers have the possibility to add a batch recycling system, where spent DE is treated with caustic to dissolve foulants and acid to neutralize the pH. The process only minimally affects the DE structure, therefore spent DE may be re-used for multiple filtration batches. Depth filters are well suited to remove particulates with a broad particle size distribution. Depth cartridges, sheets or modules utilize a dense filament matrix which can consist of inorganic material as glass, cellulose, polymers or stainless steel. Pores throughout the filter medium may be graded or symmetric. Particles are retained on the surface of the filter as well as throughout the depth of the medium. Filters utilizing a pleated depth media are well suited to the removal of particulates with a narrow particle size distribution. These elements have the advantage of a providing consistent effluent quality and high total throughput due to a lower initial differential pressure. The particles are retained mainly in the outer layers of the filter. Filters may have fixed or non-fixed pores. Filters with a fixed pore matrix are robust and provide a consistent effluent quality. Fixed pores do not change their size or retention capabilities at increasing pressures. Filters with unfixed pores can have dramatically different effective removal ratings as the pores expand and contract. Expansion of pores at higher pressures leads to particle breakthroughs, material-migration and channeling. Retained particles can be released to the downstream side and could foul downstream processing steps. Filters with non-fixed pores may also be subject to media-migration allowing filter media to pass into the filtrate. Filters with fixed pore structure should be used for all filtration stages downstream of primary filtration. Such filters may be characterized by a ß-ratio value which is an objective measurement of particulate removal efficiency. The ß-ratio is defined as the quotient of particles upstream and downstream the filter and is always related to one defined particle size. A single filter element may have multiple ß-ratio. In general, for a single filter the ß-ratio for larger particles will be higher than the for ß-ratio smaller particles. 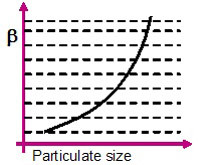 In general, the larger the particulate size the larger the ß-ratio value is for that particular micron size. The smaller the particulate size the less efficient the filter will be at removing particles in that size range. Fine and Final Filtration are the last filtration steps prior to packaging. In breweries where a three stage system (trap, fine, and final) is employed, the fine filter serves also as the pre-filtration step to protect final membranes. It is common for smaller craft breweries to utilize depth filters that serve as trap and fine filters for polishing effect and bio-burden reduction, without a final membrane in service. Target microorganisms for pre and final filtration are yeast and the common beer spoiling bacteria detailed below. Filters employed to retain these organisms from beer are not considered to be sterilizing grade. Sterilizing grade specifically refers to a membrane filter cartridge that removes >107 Brevundimonas diminuta per cm2 of filter medium (FDA definition, Aseptic Processing Guidelines 1987). Thus, final beer membrane filters (0.65 to 0.45 um microbially rated membrane cartridges) provide a reduction of microorganisms, and not necessarily a sterile product. Final membrane cartridge filters often express microbial removal efficiency in the removal of a number of microbes per cm2 of filter area or per 10″ cartridge. The microbial challenge level is a critical factor to establishing the Log Reduction Value (LRV) or titer reduction (TR). The LRV may also have a reported statistical confidence level. The LRV should be correlated to a filter integrity test value, if using a polymeric membrane filter with a microbial rating less than 1 micron. The titer reduction equals the number of organisms in the influent divided by the number of organisms in the effluent (filtrate). For example, if a filter with a TR of 106 (LRV 6) is challenged with 10,000,000 microorganisms approximately 10 CFU (colony forming unit) may be expected in the filtrate. Unlike particulate ratings, a microbial rating is not an indication of the largest opening or pore in the filter. Because the microbes multiply to produce colonies this improves the possible resolution of the organism far beyond the limitations of particulate detection. For example a microbial rating could be expressed in >12 LRV. A particulate rated filter with a beta ratio of 5000 could be expressed in a LRV for particulates. Based on the limits of particulate detection the best particulate rated filter has an LRV of only 3.7. Model organisms are often utilized to establish microbial removal ratings. For example, Saccaromyces cerevisiae is often utilized as a model for 0.65 micron microbially rated membrane filters. Serratia marcescens, similar to size to Escherichia coli and Lactobacillus sp are often utilized to qualify 0.45 micron microbially rated membrane cartridges. Alternatively specific beer spoilage organisms may be used to qualify membrane final filter performance directly. – Centrifuges & decanters – simple handling and direct inline operations are main features, no defined quality of the recovered beer and a limited recovery rate (no dia filtration possible for extract mining) are the main disadvantages. – Crossflow technologies – defined beer quality and the option to apply dia filtration for a maximum extract recovery are the key features. The most advanced technology for extract separation is based on a ceramic cross flow solution with specific control features. By controlling feed, cross flow velocity, permeate flow and pressure trends in the process and adjusting the process to target set points continuously at point of process results in an absolute gentle treatment of the yeast during the overall process. Most important is the control of permeate flux and pressure in direct relation to the cross flow speed and feed rate. By using Diafiltration from a defined process point on, the yield of the process can be increased significantly. Beside extract also a certain quantity of taste active substances are separated during the process. Results show, that by applying controlled process parameter to a yeast concentration process in combination with Diafiltration the process yield in the brewing process can be increased without compromising quality up to a level of 5% blending rate. Blending recovered beer back to main brand is taking place at final filtration. The ROI of the investment is typically < 2 years for industrial plant. Utility Filtration is necessary to protect the peripheral services that support beer production. Media in the brewery environment are water, air, gases and steam. Water used in breweries is mainly municipal water or water from own sources. It must have a sufficient quality for use in food and beverage production, e.g. free of oils, odors and pathogenic microorganisms. To prevent rust, sand and other visible particles from coming into the brewery the water should be filtered before coming into the brewery. Here, a filter grade of 10 to 40 µm (> beta 1000) retention rate is sufficient. Polypropylene depth filters are commonly used. Even finer cartridge depth filters are strictly recommended upstream UV beamers or a chlorine dioxide treatment. When water is added to the beer (to adjust the grade Plato at high gravity brewing or for high pressure injection) or to produce non alcoholic beverages a sterile filtration of the water is absolutely necessary. Here, membrane cartridge filters with a retention rate of 0.2 µm with pre-filters, which are adapted to the water quality, are used. According to the needs of the brewery a fine filtration or a membrane filtration of water is recommended for rinsing waters at bottle, can or KEG fillers as well as for the final rinsing waters in bottle washing machines. Gases to be employed in the brewery are compressed air and carbon dioxide, sometimes nitrogen and oxygen. All these gases must be free of oil and dust. To achieve this, it is necessary to filter these gases with appropriate coalescing filters and fine cartridge filters. As a rule, such filters are mainly installed at a central point, e.g. downstream compressors or CO2 vaporizers. Coalescing and fine cartridge filters should have a stabile filter matrix which does not change the filter fineness when under pressure. At the point of use, when the gases come into contact with the product, a reliable sterile filtration of the gases is a must! Here, hydrophobic 0.2 µm membrane filter cartridges are state of the art. The membrane material is PTFE. Such filters should be steamable in place. Steam often contains rust particles from carbon steel steam pipes may cause corrosion on stainless steel surfaces. Therefore it is strictly recommended to filter any steam before coming into contact with stainless steel and with the product. Filter cartridges made of porous stainless steel are able to free the steam from rust particles. A retention rate of 3 µm in dry gases is sufficient.